The night before, marinade the fillet in the olive oil, rosemary and garlic, sprinkled generously with salt and pepper, and place in the fridge. Turn from time to time. One hour before cooking, remove the meat from the fridge. To make the pesto, place all the ingredients, bar the oil, into the small bowl of a food processor, and pulse until everything is very coarsely chopped. With the machine running, add the oil until the pesto takes on a thick, creamy consistency. Taste and add more salt, or some garlic, as liked. Note that mint oxidises (goes black) very quickly, so the minute you have made the sauce, you should transfer it to a dish and closely cover it with cling film or coat with a layer of oil. Vegetables should be cooked by plunging them in boiling salted water until al dente and then refreshing in cold water. You can re-heat them by plunging them into boiling water again for a few seconds when you are ready to serve. Alternatively, any root vegetables can be braised in a casserole dish with a little white wine, lemon juice, garlic cloves, sprigs of thyme and seasoning. The liquor from this is very tasty and can be used to dress the vegetables when the dish is being assembled. Preheat a griddle pan or barbecue. Remove the garlic and rosemary from the lamb, as these tend to burn when cooked. Sear the meat over a high heat and then reduce the flame (or raise the rack) and continue to cook for approximately 15 minutes, depending on the thickness of the fillet. The meat should be well browned on the outside and pink and moist in the middle. Leave to rest in a warm place for 10 minutes before carving into thick slices. 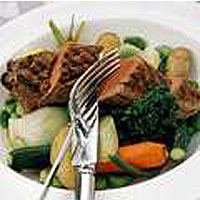 While the lamb is resting, reheat the vegetables, if necessary, as described above and arrange a selection in the bottom of four large soup plates. If you braised the root vegetables, pour over some of the reheated liquor. Carve the meat into thick slices and place on top of the vegetables along with a dollop of pesto.